Discount Domains Review 2019: Is Discount Domains a Good Hosting? 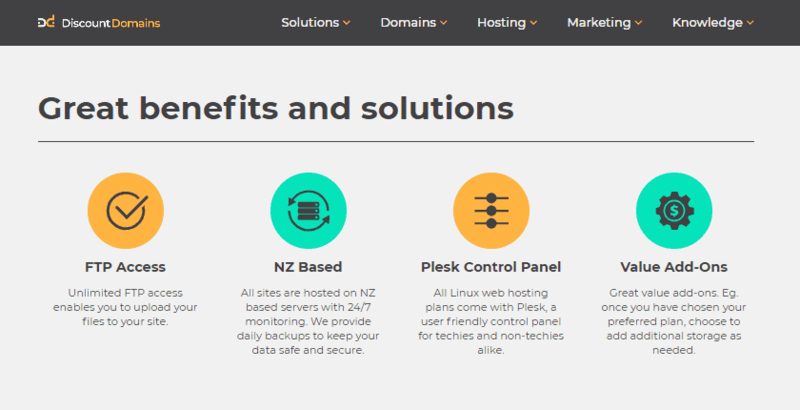 Discount Domains is a New Zealand-based domain registrar and a trusted web hosting service that provides affordable hosting packages and a number of add-ons, in addition to professional support and 24/7 monitoring. Founded in 2003, Discount Domains provides premium web hosting, email hosting, domain registration services, and SEO to over 13,000 clients. Their servers are located in New Zealand. Building a website or blog has never been easier for newbies, but with Discount Domains’ web builder, you can build a full website in minutes with their drag-and-drop interface. Choose from 100s of responsive and customizable themes with built-in e-commerce features that let you sell products and accept payments in store. Once you create pages, you can embed photos and videos and integrate a free shopping cart on your e-commerce website. Every hosting account comes with the innovative Plesk control panel, a user-friendly hosting platform for developers, techies, and agencies. It comes with a dashboard that lets you build and manage multiple websites, monitor performance, and run updates. Designed with flexibility and control in mind, their Plesk-powered hosting also lets you install third-party and open sources apps. You can easily extend the features and tools of your control panel by integrating over 100+ extensions. I find it grossly misleading, if not untruthful, for Discount Domains to claim their hosting packages are cheap when they’re clearly expensive (including their add-ons) compared to other comparable services. All of their four web hosting plans and add-ons have yearly billing cycles. The one good thing worth mentioning with regards to their pricing is that they don’t charge any setup fees. If you’d like to upgrade, you can do so quickly and easily too from their user-friendly customer portal. There’s no need to call support as provisioning is instant. 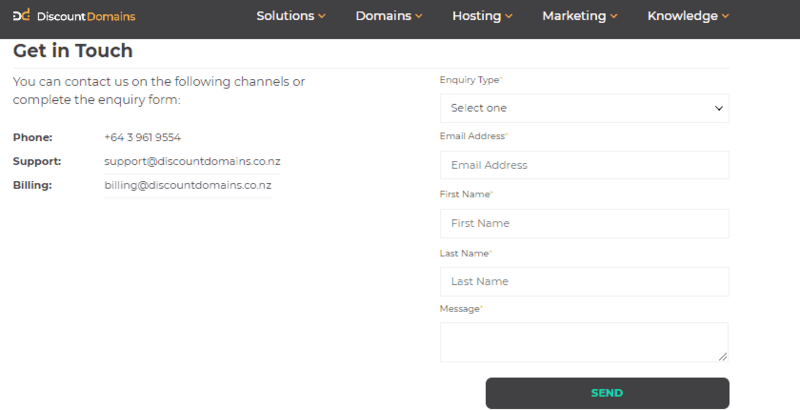 Locally-owned and operated, Discount Domains leverages the talents of trustworthy Kiwi professionals in every area of hosting. They have Linux admins, computer technicians, and network engineers who can assist you with a myriad of issues. Call their telephone support line between 8:30 a.m. – 5:30 p.m on Monday-Friday, open a ticket, or use their online contact form; they’ll help you promptly. If you’re a hands-on person like me, you’ll appreciate being able to check their FAQs and knowledge base for answers to simple hosting issues. Get Fast Hosting with Discount Domains! Wondering how Discount Domains stacks up against other Web Hosting companies? Enter any other Web Hosting company and we will give you a side-by-side comparison.